Six men, a lady and the devil, jumps, rattles, turns, flowers and bouquets of myrtle or basil. These are the elements that make up one of the most mysterious dances of Mallorca, the dance of the cossiers, which can be seen in some villages of the island in special festivities. The “xeremies”, the “tamborino” and “flabiol” perform the music of this dance. The origin of the cossiers' dance is uncertain. 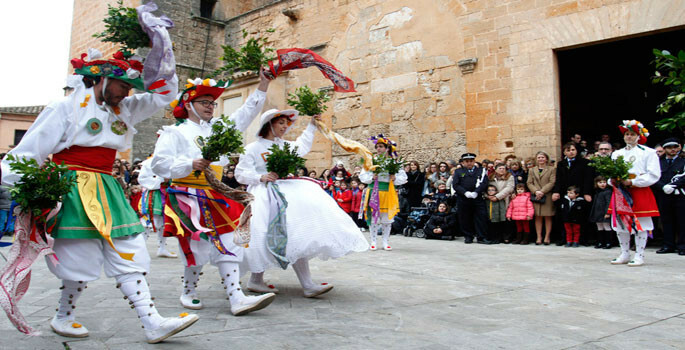 Some theories say that it was introduced to Mallorca by the catalan people, who celebrated a similar dance for the Festivity of Corpus Christi. Others, whose origin dates back to earlier times, being contemporary to the classical Mediterranean civilizations of Greece and Rome. Some even locate its origin in the Neolithic times. Be that as it may, it is a dance that has been changing over the centuries, it has been forgotten and recovered and has introduced new elements, such as those linked to the Christian religion. The lady is the character who runs the dance. Historically men played this role in the dance, but their role was always a female character. The male characters dance, jump and interact with the lady, who is the central figure of the dance. For this reason, some theories indicate that the cossiers dance was a dance for fertility. However, the character of the demon also makes right the interpretation that dance is a struggle of Good versus Evil. The figure of the demon marks the terrain of the dance, forming a circle with the help of a large club. Interacts with the public, challenging and keeping him at bay, and intervenes in the dance trying to spoil it and to disturb the lady, who is protected by the cossiers. The dance of the cossiers has slight changes depending on the locality and it adapts to the celebrations of each town. Some of the most important cossiers of the island are the next ones. The cossiers of Montuiri are the oldest ones of the island and they have danced uninterruptedly every year since the 18th century. Their dress complements the typical white of the cossier with the yellow, green and pink tones. "Banyeta Verda" is the devil who participates in this dance. The cossiers of Monutïri dance the day of the Mare de Déu d'Agost in the Festivities of Sant Bartomeu. Other of the classic and famous cossiers of Mallorca. The cossiers of Algaida recovered their dance in the decade of the 70 after a decade of stop. In the dance "Titoieta", the lady defeats the demon. The cossiers of Algaida dance the days of Sant Honorat, the patron saint of the town and the festivities of Sant Jaume. Recovered in the 80's after being inactive since the spanish civil war, the dance of the cossiers of Manacor has recently been named Festivity with Cultural Interest. The cossiers of Manacor dance on the occasion of Fires i Festes de Primavera and also for Pentecost. The cossiers of Alaró perform their dances for the festivities of Sant Roc. They have been the last to have allowed women to participate in the dance that plays the lady since 2016. They stand out for their colorful dresses, entirely pink, red and blue.